In each of our product listings, along with the basic handle description are a series of dimensions which relate to that particular handle. This is designed to give you an indication of the overall size and proportions of the handle and the diagrams shown provide you with the necessary information for you to make your selection. A kitchen / bedroom door or drawer handle is easy to replace - Standard popular sizes include 96mm, 128mm, 160mm, 192mm etc - although there are lots of other hole centre sizes too. 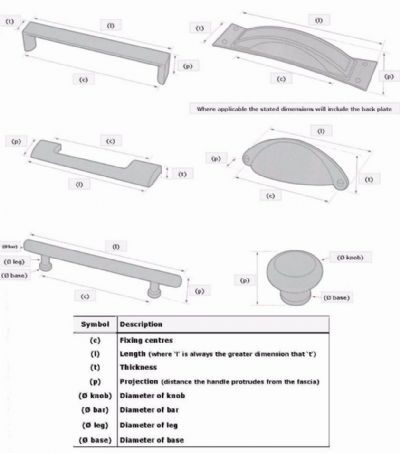 Simply look on the door or drawer after removing an existing handle and measure centre to centre of the existing holes to see which size handle you will need. All measurements are taken in millimetres. A kitchen / bedroom door or drawer knob is just 1 hole and 1 screw required. However, please remember that your replacement knob must have a wider base than your current knob especially if there are marks on the door, for example, where a handle has been over-tightened.